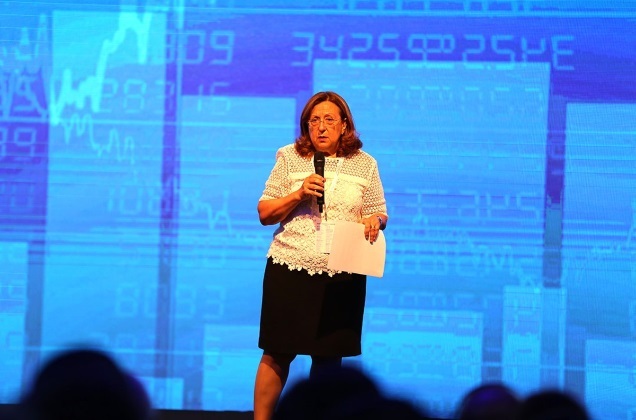 The Sabancı University Center of Excellence in Finance (CEF) held a conference titled "The Future of Financial Markets" featuring Turkish and international subject matter experts. 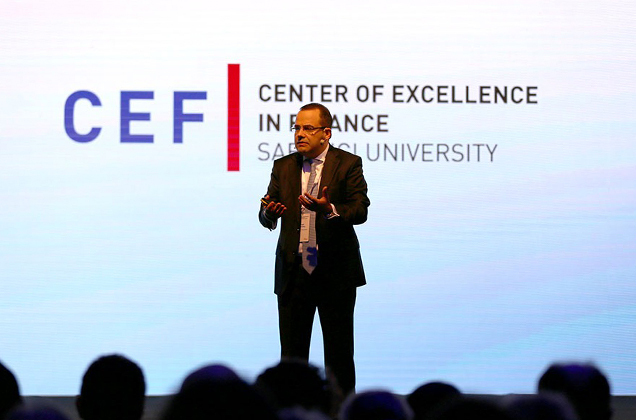 The Sabancı University Center of Excellence in Finance (CEF) established with the founding sponsorship of Akbank held the second event in its international conference series on Tuesday, June 26, 2018. 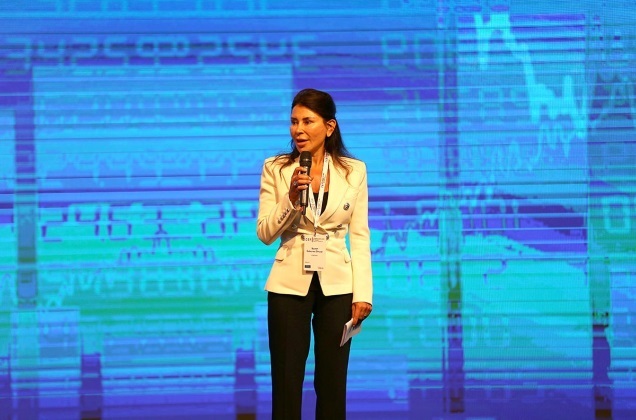 The conference, titled "The Future of Financial Markets", brought together Turkish and international experts to discuss fintech ventures, the banking industry, and the blockchain technology. The conference also featured an address by renowned investor Mark Mobius. Introductory remarks were made by Sabancı University Finance Chair Özgür Demirtaş, Sabancı University President Zehra Sayers, and Akbank Board of Directors Chair and Managing Director Suzan Sabancı Dinçer. Fintech ventures and the blockchain technology, two top agenda items in economics around the world, and the latest developments in the banking sector were the subjects of the conference. In his introductory remarks, Özgür Demirtaş noted the success of CEF, saying: “We have made remarkable achievements in a remarkably short time. By our second year, we have trained hundreds of students and professionals, and invited leading speakers from around the world to Turkey. CEF will continue to be a symbol of quality, a hub for finance education, and a leader in promoting Turkey globally." 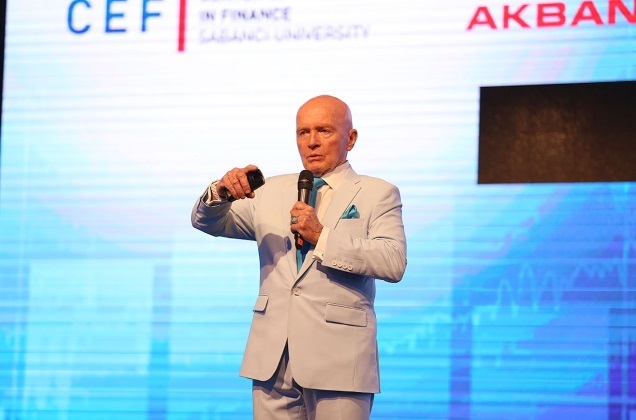 Dr. Mark Mobius, renowned investor and founder of Mobius Capital Partners, made the following remarks in his keynote address: “Developing markets have been gaining in importance. We love Turkey because it's a developing market that grows at an incredible rate. In terms of demographic opportunities, the median age in developing countries is 26. While developed countries have greater GDP, developing countries have an average price-to-income ratio of 12.5%. Asia, Africa and Latin America are the markets that we consider to have the possibility to develop. People think Africa is difficult but actually there are great opportunities there. Cheap currency is not always a problem; anything that occurs in a developing market may be an opportunity for us. China has the greatest proportion of internet users worldwide with 21%. 1.4 billion smartphones were sold in 2017 and they will change the future because they have great political and economic implications." Entrepreneurs and professionals discussed "Private Sector in Turkey and the Path to the Future"
The moderator of the "Private Sector in Turkey and the Path to the Future" panel was Akbank General Manager Hakan Binbaşgil. Speakers were McKinsey & Company Senior Partner and Country Director Can Kendi, P&G Turkey and Caucasus CEO Tankut Turnaoğlu, General Electric Turkey President and CEO Canan Özsoy, and Yemeksepeti.com CEO and Founding Partner Nevzat Aydın. "Academic Perspectives for Global Economies in Recovery"
The second panel in the conference, titled "Academic Perspectives for Global Economies in Recovery", was moderated by Sabancı University Associate Professors Yiğit Atılgan and Evrim Akdoğu. The panelists of this section were New York-based international consultants Oliver Wyman Vice President Dr. Uğur Köylüoğlu, Boston College Chair Prof. Philip Strahan, and Georgia State University Chair Prof. Vikas Agarwal. The final panel in the CEF Conference discussed the operation, potential uses and opportunities regarding the future technology “Blockchain”. Also discussed in the panel moderated by Sabancı University Finance Chair and CEF Founding President Professor Özgür Demirtaş were the short- and long-term expectations for the implications of the Blockchain technology on finance and business in general. Discussion points included technical and legislative hazards, such as the perceived threat as cyrptocurrencies made possible by the Blockchain technology compete with national currencies, the concentration of a significant portion of assets in few investors, and scale or transaction speed constraints. Panelists were crypto-asset trust service Trustology Founder and CEO Alex Batlin, Blockchain consultants 11:FS Founding Partner Simon Taylor, and insurance-related Blockchain operator iXledger Founding Partner and COO Cristina Dolan.